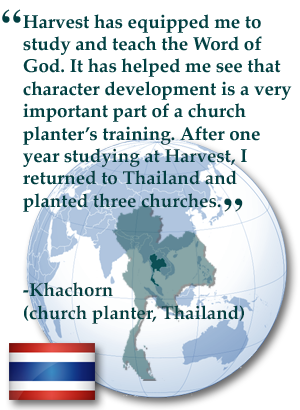 Harvest Bible University offers degree programs to fit the varying needs of individual students. The following pages describe the different degrees and their requirements. We strongly encourage you to work toward your degree. Many people want to “simply take a few courses in the Bible.” That’s wonderful, and we have arranged the schedule to make this possible, because we want everyone to be able to learn God’s Word. We’re glad to have you take just one course, or as many as you like. However, we suggest that you work toward a degree because there is great value in setting a goal, working toward it, and completing it. In fact, one of the reasons a university degree is important in our society today is that it demonstrates a person is able to finish what he or she starts. There are other values, too, such as the fact that the curriculum is carefully designed and scheduled to provide each student with a complete, balanced education in the Bible, Christian life, and ministry. Leaving out classes creates gaps which make a person vulnerable in life and doctrine. But whatever you choose, we welcome you and offer you the freedom to meet your needs here in Bible university. We’re here to serve you. Here is how the degrees build on each other. Choose the level you desire to attain. Each course at Harvest is offered by one of six departments: Bible, Theology, Language, Character, Ministry, or Evangelism. Every degree should have courses from all six departments so as to develop breadth and balance in the student’s life. Specific suggestions are delineated in the section on degree descriptions. 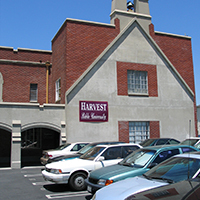 Harvest Bible University has been purposely structured with many locations so that students may remain in their own area to minister while attending university to train for greater effectiveness. This decentralized approach requires that provision must be made to offer students sufficient courses for their degrees at each campus. Therefore, each course is carefully constructed so that various levels of students may take it simultaneously. This multi-track approach means that homework requirements, grading scale, and class participation activities will differ for undergraduate and graduate students appropriate to their level. Courses are identified by a two-letter department name abbreviation followed by a three-digit course number, such as TH-434. If the course spans more than one quarter a letter is appended to the course number to indicate which part of the series it is, such as CD-121a, CD-121b. Courses are numbered according to their recommended level to aid students in developing a long-term educational plan. However, students are free to take courses that fit their needs at any time in their program. Harvest is the university for all people, the place where people of all races and ethnicities come together as the family of God to learn at His feet. Courses are taught in any language with enough students to constitute a class. You can tell what courses are available in a particular language by looking at the current schedule which specifies the language for each course. Students may major in Ministry, Missions, or Divinity, based on their level (undergraduate or graduate) and which of the three Harvest schools they choose to major in. Courses are offered by six different departments to all students in the three schools. 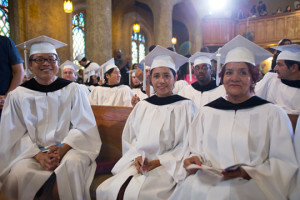 A certain number of units is recommended in each of the six departments for each degree, but the student is free to choose the courses that will be most beneficial for his or her own gifts, calling and ministry situation.